Bats are associated with blindness to the point that there is a popular cliché ‘as blind as a bat’. Though they may represent a benchmark for blindness, the flying mammals are not completely without sight. Their sight may be less than perfect though which is perhaps why nature has ensured that bats have a remarkable tool that helps them navigate seamlessly through the darkest night. That tool is echolocation. This is one of the specific bat features that bat exclusion experts must take into consideration when carrying out their bat control activities. Bats use a complex system of sounds to aid them in their nightly tours across the land. They use sound waves to identify the locations of objects in space. Echolocation is a skill that has been perfected by bats over centuries. They use this ability to scour the land for food at night and to avoid colliding with objects as they fly around. Bats emit sounds through their mouth or nose and listen for the sound to bounce back to it as an echo. Depending on the type of sound that returns the bat is able to identify food items such as moths. You can think of it as a bullet that ricochets off a surface or a ball that you release to the ground that bounces back to you. 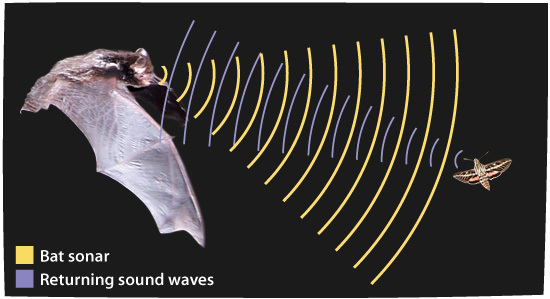 For bats, this happens with sound. Bats are wired to detect the location size and type of object hit by the sound based on the echo that gets back to them. This is how they differentiate between a moth and a building, for example. Popularly known as sonar, echolocation sound waves used by bats or bat screeches can detect objects that are tiny as a strand of human hair. Bats can also use their sonar skills aggressively or competitively. In order to exclude others from food sources, some species of bats are known to obstruct the waves of others. This prevents other bats from getting to the targeted food item. The pitch of the sound waves is often undetectable to human ears. Most animals and insects are also unable to hear bat sonar. A few species of moths and beetles can hear the sound however and will try to avoid being eaten by their predator. Bats make this difficult by changing their flight patterns (by going in circular or zigzag patterns for example) to confuse their prey. Yes, it would be pretty cool if Batman visited your house but all jokes aside, these creatures are not ideal houseguests. If you do spot a bat make sure you call experts like Skedaddle Humane Wildlife Control to save the day. 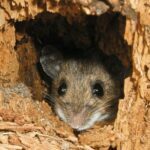 If bats have established colonies in your home, Skedaddle’s wildlife technicians can help you to remove them safely. Usually, bats in your home are there to hibernate, though from time to time a bat may fly inside accidentally outside of its hibernation period. In both cases, safe bat removal is important since bats are such important members of the ecosystem. They help to keep insect populations controlled as that is their main food source and they are helpful for reforestation since they often drop seeds as they fly. Before bats make it into your home, Skedaddle can work with you to prevent their entry. Our technicians do this through a combination of bat exclusion strategies designed to target specific bat species. This includes capping chimneys and vents to prevent bat entry. 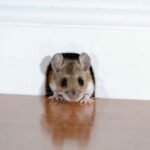 Bat exclusion can also be done (and is always recommended) after a bat removal service.